This story begins long ago, before cancer, when I was pregnant for Elijah. Some of you might know that I loved childbirth. Crazy, I know, but I did. I wasn’t overly fond of pregnancy, especially the first and last trimester, so I suppose you might ask why I liked having babies? It was the birth, all about the birth. (I enjoy quick, extremely painful things, not drawn out low-grade pain. But I loved the miracle of birth. 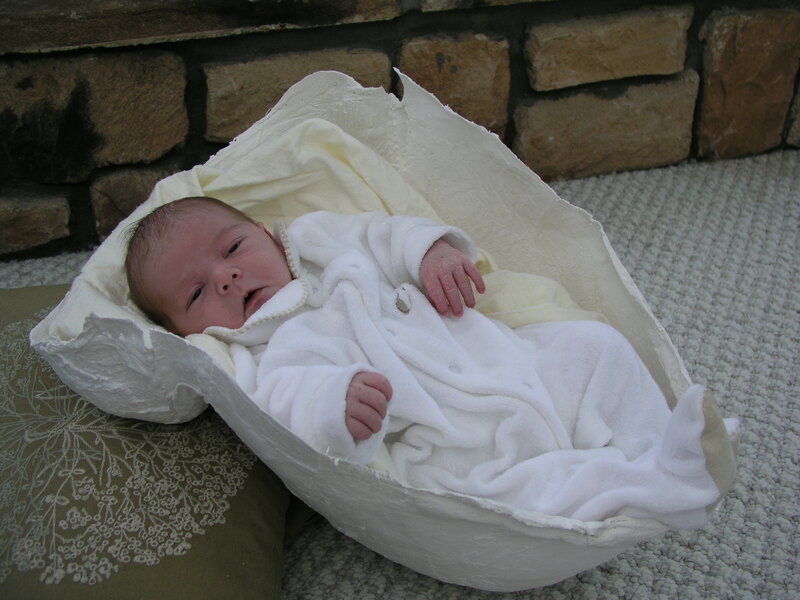 Every one of my children was born naturally, and my last baby, Elijah was born at home during a cold January night. Totally planned with a certified midwife. It was beautiful. So as I was preparing to give birth to Elijah, it occurred to me that this was my last pregnancy and I should do something to remember it. I had heard about belly casting, but always thought it would be expensive. But I started reading about it and realized I could go and get paper mache materials at Michael’s and Jeremy could help me do it. Actually, Charis and Meleah helped too. A decision was made that we would do my belly and my breasts. A decision I’m actually thankful for now. Jeremy wrapped me in plastic wrap. Something he’s always secretly wanted to do. 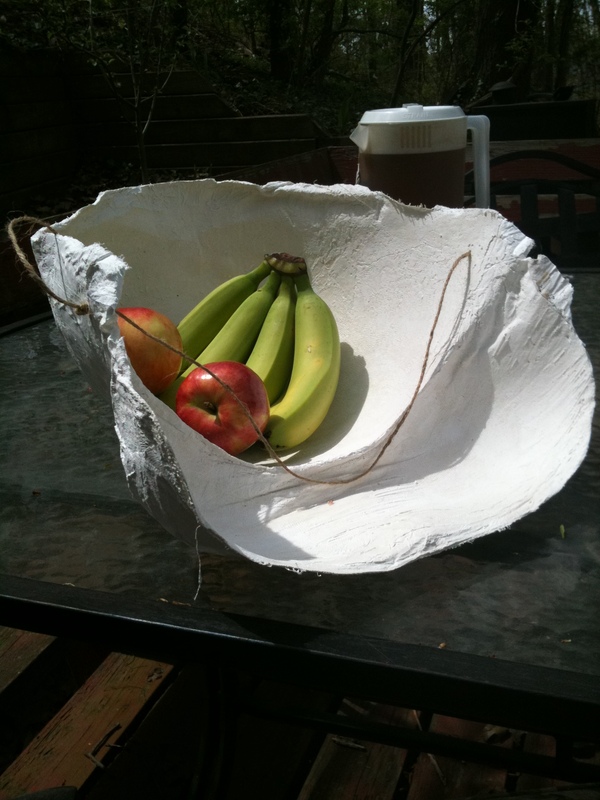 And the paper mache-ing began. I remember it being a night of laughter and fun. 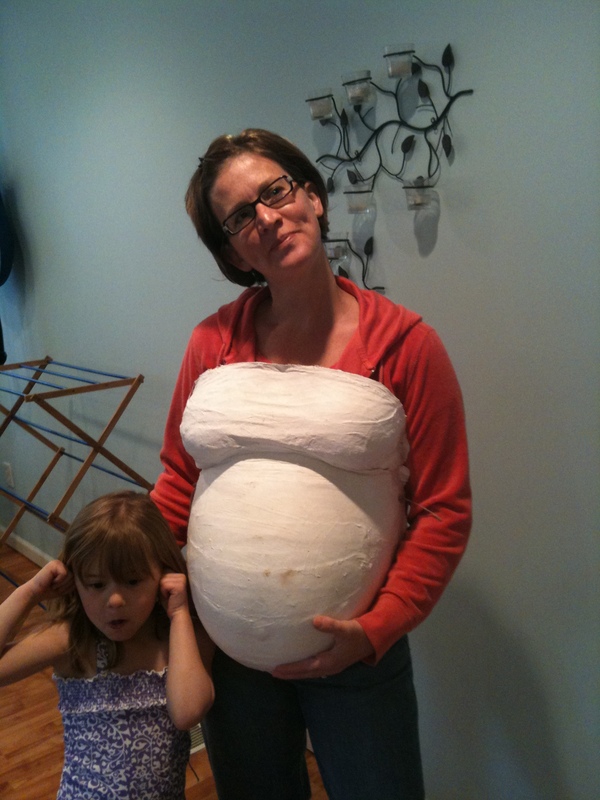 Me, 9 months pregnant, wrapped in paper mache goo. And then I had to wait for it to dry….lol! I didn’t realize how glad I would be to have that belly/breast cast. So there it’s been, down in the basement waiting for me to pull it out, dust it off and do something with it. But WHAT should I do with it? I mean c’mon people….even YOU would feel a little weird if I invited you over for dinner, and there, displayed over the dining room table was my belly/breast cast, of which I have neither anymore. Ummmm…..awkward. I’m pretty sure you would either bust out laughing or try not to look at it. The question is, which would you be….lol! 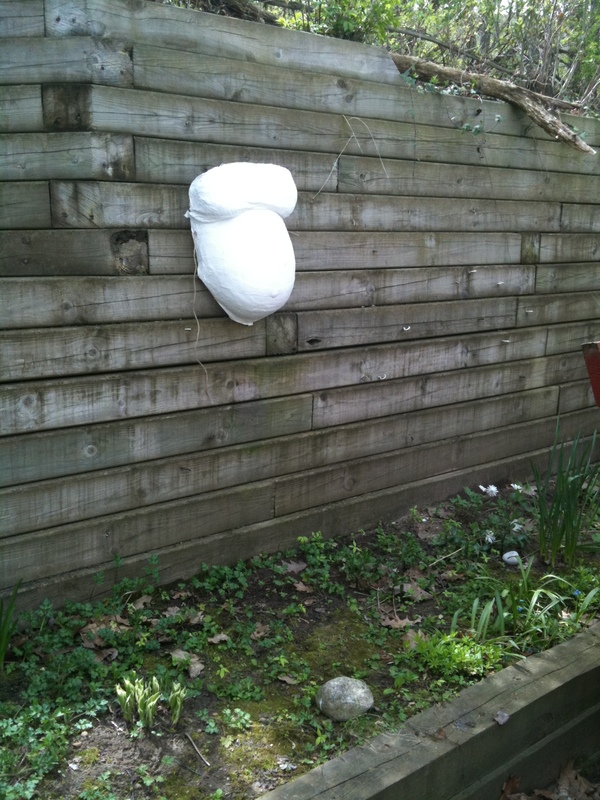 Here's the first thing I did with my belly cast. I put my sweet little baby Elijah back in it for a photo shoot. 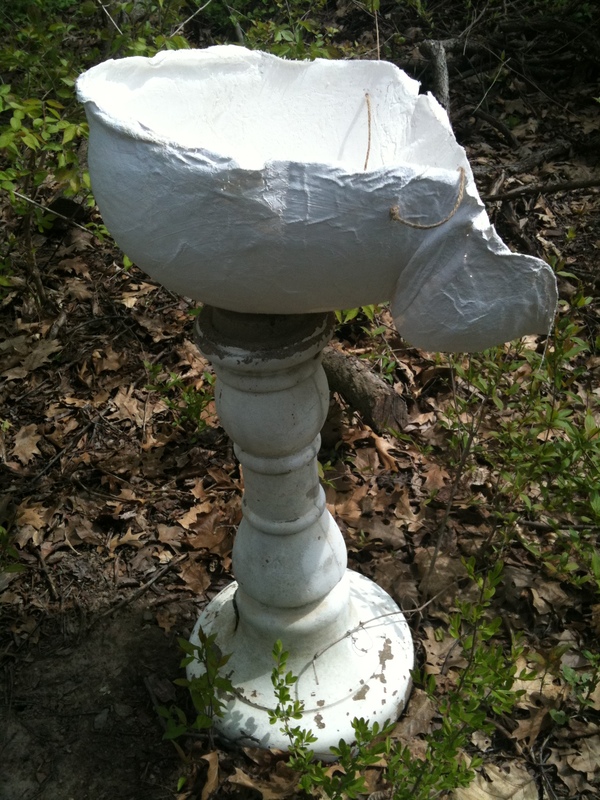 Maybe I should coat it in outdoor paint and make it a lawn ornament....for the back yard of coarse...lol! Maybe I could make i t in to a bird bath. I think I've read "Once Upon a Potty" one too many times. Maybe I could just wear it around for the fun of it. I think my plastic surgeon should see this, no wonder my belly was so flabby. I was HUGE! I really want to do something with my belly. I joke about it, and it is kind of funny that I have this belly cast, but now that I’ve had breast cancer it takes on more value for me. What I’d really like to do is have someone else decorate it for me. Maybe they could decorate my cast AND me, like Michael Colanero does here at Breast Cancer Awareness Body Painting Project? Such a cool thing he’s doing there. Check out this video. This one is censored, but the other’s aren’t so be WARNED! I wish some place like this would paint my cast for me! And what’s up with painting casts of women who don’t have breast cancer. What would be really great is if they offered casts to women who were about ready to lose their breasts! What a cool gift! But I get it. There’s not much money in gifting a breast cast **sigh**. And the point is to raise money for a cure….which of coarse I am 100% behind as well. Just wish I could find someone to do something cool with my cast! Hint, hint! So if I do paint this thing myself. What should I do? Maybe I can make it in to a fruit bowl?